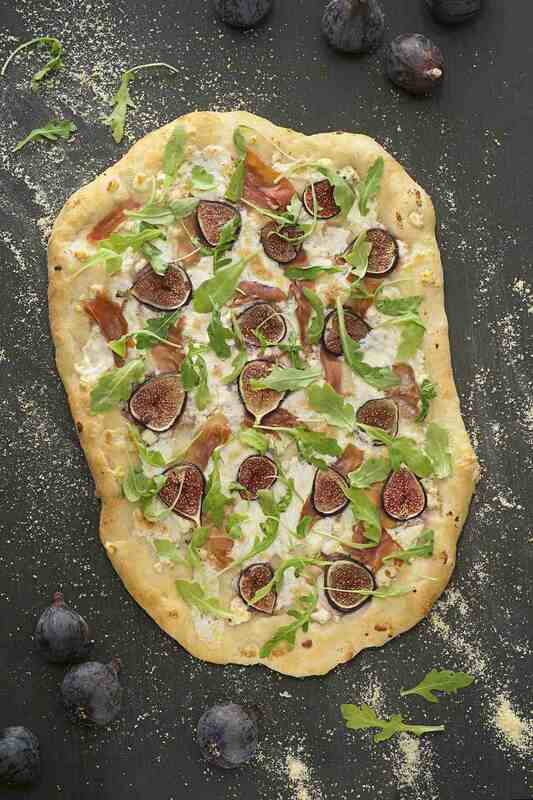 It's an established fact that figs and arugula work really well together. Factor in a nicely grilled pizza crust, and the end result is perfection. Choose a good, sharp cheese to round out the flavor of this dish. You can serve this pizza as the main course or cut into smaller pieces and serve as appetizers. The more rustic this looks, the better. 2. Cut pizza dough in half. On floured surface, roll out both pieces into 8-inch circles (or oblong shapes, depending on preference). Wash, dry and slice the figs in half, lengthwise. Brush cut sides with a little vegetable oil. Place dough and figs on the grill. 3. Grill one side of dough only, about 2 minutes, until it starts to brown. Grill figs for 2-4 minutes. Watch for burning. Remove crusts and figs. Once figs have cooled a bit, cut once more lengthwise. This will allow you to place them onto the crust with a little more ease. Using a pastry or sauce brush, apply olive oil to the cooked side of the dough, carefully add figs on top. Place pizza (raw side down) once more onto the grill grate. Close lid and cook for an additional 2-4 minutes, or until dough is golden brown and cooked through. 4. Remove from heat and place onto large cookie sheet. Top pizzas with baby arugula, shaved Manchego or Parmesan cheese, and drizzle with your favorite balsamic vinegar. Slice and serve.